Did you know apple cider vinegar has all sorts of great health benefits? Well, now you do. It's great to soak hands and feet in for mani/pedis. And if you put a teaspoon or two in water and drink it three times a day it's a natural energy and metabolism booster. Well you know what I like best about it? It's the world's. best. toner. You are suposed to dilute to one part water one part acv when you use it on your face, or you can dilute it more depending on your skin type. I don't have another bottle to put it in, so until my bottle is half gone, (which takes forever) I just get a cotton ball wet and then put the acv on it and rub it all over my face after I have already washed it. I use it morning and night. Yes, it reeks when you put it on, but as soon as your face dries it doesn't smell anymore, I promise. I use my normal moisturizer afterwards, and ojala! It removes blemishes like crazy, even the ones I thought were permanent. This stuff is better than Proactiv. Way better. However...be patient. At first it might actually make your skin worse because it pulls a lot of junk out of your skin bringing it to the surface. That clears up in about a week (for me) and the longer I use it, the better my face gets. I use the kind above. I got it at the health food store for four bucks. It lasts forever. It's a dream. And that's all I have to say about that. UPDATE 3/3/2013: In addition to this, I now use coconut oil on my face, too. Best decision I ever made. I use it morning and night too, and it gives your face that dewey, young, fresh-faced look that everyone wants. It makes my pores smaller and my skin feel great. I take about 1/2 tsp and put it on in the morning and then get in the shower and do my usual routine while it sits on my face. The hot water and humidity does something wonderful. 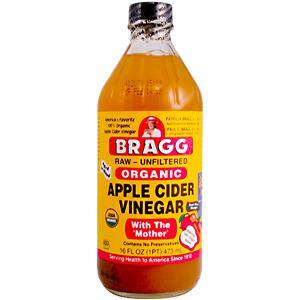 At the end of my shower I wipe the oil off my face with the hot water, then use the ACV, then, moisturize like normal. At night I put it on my face and it removes makeup crazy well! I leave it on while i brush/floss/remove contacts/etc and then remove oil with hot water. Then tone with ACV and moisturize. Love it!